Bruno says Brighton have to pick up points against the top six in their battle to stay in the Premier League. champions Chelsea at the Amex on Saturday (12.30pm). Albion went down 2-0 at Stamford Bridge on Boxing Day as second-half goals from Alvaro Morata and Marcos Alonso took Chelsea to victory. 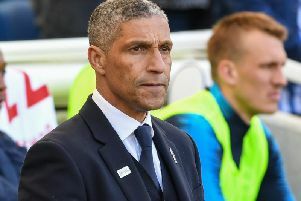 Brighton have collected just eight points from their last 12 matches, after a 2-0 defeat at West Brom on Saturday and looking ahead to tomorrow’s match, Bruno said: “It’s a big one. Against the top six we have to get something, the extra points. Bruno added the Seagulls will keep fighting to stay in the top flight. They are three points ahead of third-from-bottom Stoke and speaking after the defeat at the Baggies, who won for the first time in 21 Premier League matches, Bruno said: “We’re really disappointed because we knew how important this game was. “The team is ready because we knew it was not going to be easy to be in the Premier League. Brighton conceded twice from corners at West Brom as their set-piece woes continued and Bruno said: “It’s really disappointing because we came here to get the three points and we conceded two goals from set-pieces and that doesn’t give us any chance to win the game. “If you analyse the game, we had good possession, we got into the last third a lot of times, inside the box, good areas, but we didn’t score and we didn’t create that many chances.